If your kitchen is like ours, your favorite family recipes are always the first ones to get destroyed from frequent use. They wear the signs of our love with spills, tears and smudges. Most of them are tattooed with the remains of their ingredients. 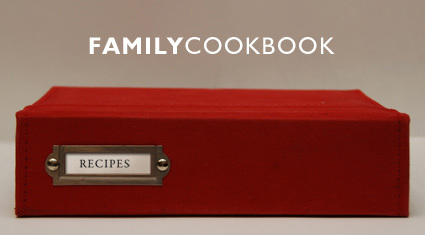 This is an easy way to organize and protect those recipes you hold most dear. We love having our book right in the action when we cook, and this keeps things nice and clean. This book is has plastic sleeves designed to hold 4″ x 6″ photos, or in this case, regular old index cards. Plastic sleeves protect the recipes from nearly every kind of spill. It is also easy to wipe down and clean from time to time. Other kinds of books and card indexes often leaves you flipping back and forth while trying to cook. 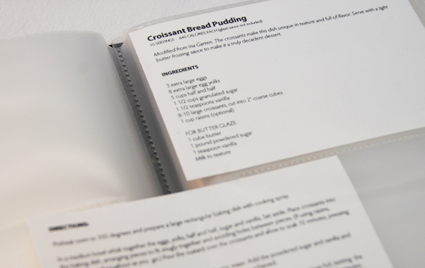 This book uses the top card for recipe title, serving size, calories, and ingredients. The bottom card contains all of the instructions. I created a template in Microsoft Word and typed all of our recipes into the same format. Click here to download it. After printing them out, it was as simple matter of sliding the cards into the sleeves. I like to have each sleeve with two cards back-to-back so there is a recipe showing on each side of the page.